EasyKey-2 is a sleek full-size multimedia wired keyboard. The keyboard features its bright shortcut keys and necessary numerical keys for multiple uses added for the user’s convenience. Designated keys for email, search, refresh and favourites make the usage very convenient. Additional designated keys for volume, mute, my computer, calculator, sleep and power allows you to save the maximum amount of time. It is a lifesaver for people who work on their computers for hours together. You do not have to worry about dying battery or continuously failing Bluetooth connection. Simply plug the wire in and start using it with any hassle. EasyKey-2 is a long-lasting keyboard with 10 million keystroke life. The keys are very soft and silent which means you can work without the annoying sound of hard key hits. Don't struggle with accuracy and speed when typing on your small touchscreen devices, feel the benefits of a full-sized QWERTY keypad, with all the features and functions of a normal keyboard. The Promate EasyKey-2 comes with an adjustable tilt leg which can be used to adjust the keyboard into angles suitable and comfortable for the user. Just adjust the legs on the bottom of the keyboard according to your comfort. EasyKey-2 comes with whisper quite keys which are soft and silent for a comfortable and feel-good typing experience. The keys are made low profile and silent which barely makes a sound so that you can work and type effortlessly without any disturbance. EasyKey-2 is specially designed by keeping in mind the requirement of frequent gamers. 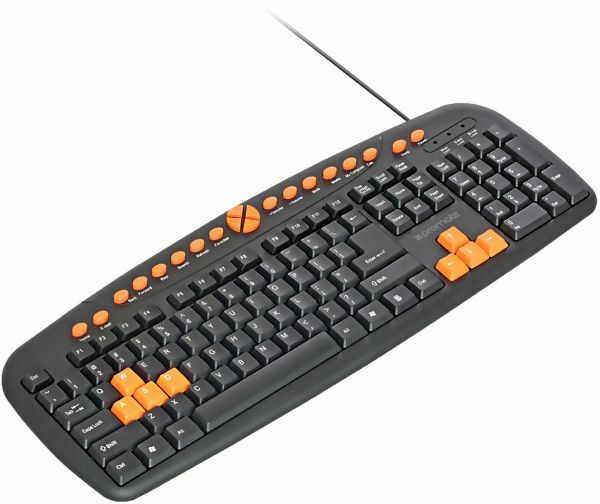 Hence the movements and control keys are highlighted for precise and more accurate movements with easy controls. The highlighted movement keys also help in using the EasyKey-2 in the dark without any light for a complete gaming experience. The EasyKey-2 comes with Bold, Bright characters which makes it easier to read. It is the perfect mate for senior citizens and can be even used to type under nightlamps with less visibility. Keeping in mind the Professional Gamers and the performance they require, EasyKey-2 has a very fast response time no matter how fast you play. With EasyKey-2 Performance and Speed is Guaranteed. The Promate EasyKey-2 is very easy to use with the simple plug and play way. Simply plug it into your USB Port and start typing. No hassle of third party software and other installations. You do not have to worry about dying battery or continuously failing Bluetooth connection. Simply plug the wire in and start using it with any hassle Just Plug and Type. The Promate Keyboard form is also super slim and lightweight, so you can take it with you anywhere. Perfect for use at home, at work or on the go, the Bluetooth Keyboard fits neatly in any bag and is light enough to carry around all day.